It’s no secret that selling to ‘real’ people can be challenging. (Yes, even with the fast growth of e-commerce, many of us still sell to a human being.) The same input does not guarantee the same output (closed sale, upsells, etc.) How frustrating that can be! The webinar is 60 minutes and we have secret gifts for you at the end to help YOU succeed in selling. 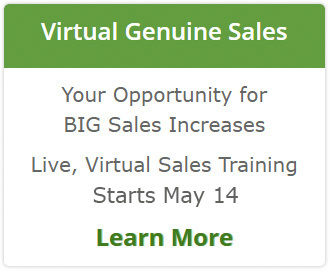 Please join us for the FREE webinar, The Secret to Selling Success sponsored by Verizon Wireless and SalesGravy.com. It’s part of the Women in Sales webinar series.